A photographer named, George (Jake Weber) is taking his family to upstate New York to get away from the stresses of work in Manhattan. On the way to a cabin, George hits deer with his car. A nearby hunter gets in argument with him. Once the family arrives at the cabin, something seems eerily off about the place. George learns about the legend of the Wendigo from a shopkeeper, and slowly his life begins to unravel as he becomes more and more convinced that one is stalking him. Unsure of what is real anymore, George begins to hallucinate, or least think he’s hallucinating. George isn’t he only one in the woods who has been driven towards insanity. 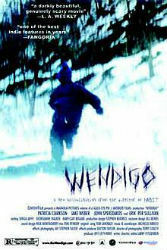 Wendigo works as both a psychological and supernatural horror film. Fessenden uses those elements to both reinforce and cast doubt on one another, and as a result, it’s easy to identify with George’s crisis. There is an omnipresent menace from the very beginning, and the dark snow-filled woods create a note of desolation and dread that still lingers after the movie is over. The image of the Wendigo itself might seem a little off, but I felt it just added to strangeness of the whole story. The supernatural horror of the Wendigo is held up in contrast to the very real horror of an obsessively angry hunter. The film isn’t quite as successful in the last half hour of mixing these threats, but it cruises to a finish on atmosphere alone.